The Ambanis will also host their friends and family in Udaipur the week prior. Mukesh and Nita Ambani's daughter Isha Ambani and Ajay and Swati Piramal's son Anand Piramal are set to tie the knot on December 12 in Mumbai. The Ambanis and Piramals released a joint statement to the announcing the venue and date of the wedding. 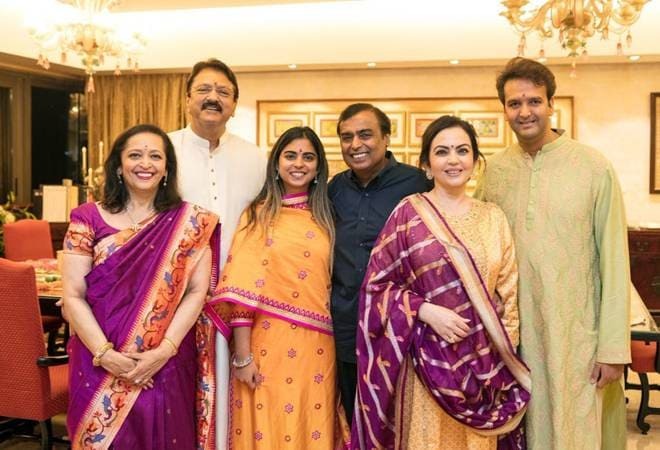 "We are delighted to share that the marriage of Isha Ambani and Anand Piramal will take place in the residence of Shri Mukesh Ambani and Smt Nita Ambani in Mumbai with family members and close friends on December 12, 2018. The ceremonies will be performed in accordance with Indian traditions, customs and culture," the statement read. "During the weekend prior to the wedding, the Ambani and Piramal families will host their friends and family in Udaipur, where they are partnering with artisans and craftsmens to integrate local culture and traditions into the festivities," it added. "Both families seek the blessings and good wishes of everyone for Isha and Anand as they start their journey of togetherness," the families said. On Monday, the parents as well as the Ambani matriarch, Kokilaben, paid a visit to Siddhivinayak temple to offer the first invitation to Lord Ganesha. In September, the couple got engaged in Lake Como in Italy. The Ambanis hosted a lavish three-day affair in Lake Como for their daughter. There were various events slotted over the festive weekend, from welcome lunches to dinners and dances to celebrate their engagement. In March this year, Mukesh Ambani's son Akash Ambani also got engaged to Shloka Mehta, daughter of diamond merchant Russell Mehta.